Founder, Director and Servant of the Potter’s Hand Foundation. 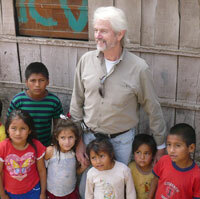 I was led to begin this ministry of helping children in need because of my experiences in Peru which began in 2003. I traveled to Peru in 2003 as a member of a mission team from my home church in Florida, where we visited the children of The Posada de Amor orphanage and children’s home in Cieneguilla, Lima, Peru. I was profoundly affected by this experience in a way I didn’t expect. Even though the children in this home were orphans or children of parents who could not support them I found something in them that had been missing in myself. They were family. And they were living in the love of Jesus Christ. When I returned to the ‘States’ I found that I needed to go back and I was not sure why at the time. I did go back in 2004 with my church and again on a personal journey to share Christmas with these children. I had been back many times since then and I started to think about how could I serve the children of Peru. A new dimension for me. I am also blessed to be involved with Reliv International, Inc., a food science company in the ‘States’ which has a foundational organization, The Reliv Kalogris Foundation that is providing daily nutritional supplementation to thousands of poor and malnourished children around the world. So as I worked to follow through on this calling I was blessed to contact the foundation and to receive their commitment to provide their Reliv Now for Kids nutritional products for children. I moved to Peru in 2007 and by early 2008 we received our first shipment of products and began our programs. To update, at this time in the year 2017 our situation with the Reliv Kalogris Foundation has changed and due to their worldwide commitments and constraints the foundation is no longer able to provide their children’s nutritional supplements to us as an annual donation. I am eternally grateful to the RKF and I certainly applaud and pray for all they do to serve children in great need around the world. To this end we, here in Peru, partnering with our Peruvian friends and non- profit ministries are working to continue; to purchase the Reliv Now For Kids nutritional supplements directly from Reliv International, Inc and provide these wonderful life changing products to children in need and at risk. It is the calling and vision of the Potter’s Hand Foundation to continue our ministry to the children here in Peru as God our Father purposes, protects, provides and provisions. And my personal calling to love and to serve! With the direction and calling of our Lord Jesus and the support of many local volunteers and coordinators we strive to grow and reach many more children who are in need and at risk here in Peru and beyond.